HONOR THY FATHER AND THY MOTHER! This Sunday is the Feast of the Holy Family, Jesus, Mary and Joseph. In this important solemnity, the Church seeks to remind us that God's supreme act of love in sending his Son to redeem us from our sins gave us examples to live by. Not only did Jesus teach us how to live as children of God but also how to live as a family. His holy family is the eternal model for us to live in love, commitment and submission to the will of God. Our first reading, taken from the Book of Sirach (Sir 3:2-6, 12-14), is a clear instruction on how to revere and honor our parents. It was a teaching Jesus most likely heard from his parents as he was growing up. "God sets a father in honor over his children; a mother's authority he confirms over her sons. Whoever honors his father atones for sins, and preserves himself from them. When he prays, he is heard; he stores up riches who reveres his mother. Whoever honors his father is gladdened by children, and, when he prays, is heard. Whoever reveres his father will live a long life; he who obeys his father brings comfort to his mother. My son, take care of your father when he is old; grieve him not as long as he lives. Even if his mind fail, be considerate of him; revile him not all the days of his life; kindness to a father will not be forgotten, firmly planted against the debt of your sins -a house raised in justice to you." Our Gospel reading (Luke 2:41-52) is the story we know well as The Finding in the Temple. It is a story of the tension of an adolescent Jesus, full of zeal to be about his father's business, and yet very much under the control and protection of his parents. In the end, he returned with them to Nazareth and was obedient to his parents, while his mother pondered all these events in her heart. "After three days they found him in the temple, sitting in the midst of the teachers, listening to them and asking them questions,and all who heard him were astounded at his understanding and his answers. When his parents saw him, they were astonished, and his mother said to him, 'Son, why have you done this to us? Your father and I have been looking for you with great anxiety.' And he said to them, 'Why were you looking for me? Did you not know that I must be in my Father's house?' But they did not understand what he said to them.He went down with them and came to Nazareth, and was obedient to them; and his mother kept all these things in her heart. And Jesus advanced in wisdom and age and favor before God and man." In our Epistle reading (Colossians 3:12-21) , Saint Paul gives us instruction on how we are to live among our brothers and sisters, not only within our families but with all children of God, siblings in the Lord Jesus Christ. "Put on, as God's chosen ones, holy and beloved, heartfelt compassion, kindness, humility, gentleness, and patience, bearing with one another and forgiving one another, if one has a grievance against another; as the Lord has forgiven you, so must you also do. And over all these put on love, that is, the bond of perfection. And let the peace of Christ control your hearts, the peace into which you were also called in one body. And be thankful." The family is the vehicle through which we journey back home to the Father, and our parents, brothers, sisters, and siblings in Christ are all on the same journey with us. 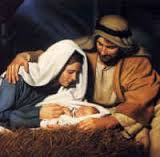 May we pray for guidance and follow the example set for us by the holy family of Jesus, Mary and Joseph.